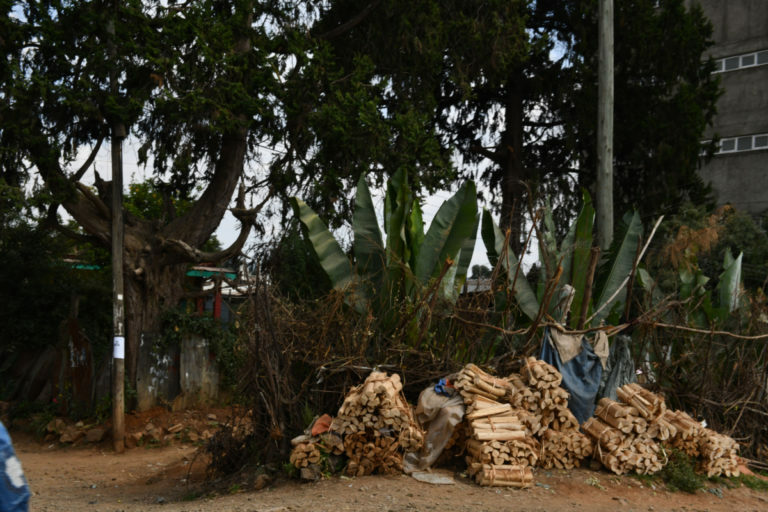 In Addis Ababa, approximately 35 percent of the household fuelwood – mainly eucalyptus – is systematically gathered from the Entoto Mountains just outside the city. Ethiopia historically planted large areas with fast-growing eucalyptus, a non-native species, to meet the demand for fuelwood. But the trees’ water-hogging nature has had a destructive impact on the land. There are efforts to reforest areas with native species, supported by the Ethiopian Orthodox Church, which has a tradition of maintaining tree gardens throughout the country. ENTOTO, Ethiopia — In a tiny home not far from the U.S. Embassy in Addis Ababa, 80-year-old Aragash Boka finally rests from a long day’s work carrying an awkward, heavy load. Boka lives and works in a corner of the world where, for the most part, fuelwood has remained important to daily life for centuries. Ethiopia is a vortex of culture and humanity, starting with the fact that it’s home to three of the things humans value the most: faith, fire and coffee. On any given day, Boka is one of thousands of women who walk from the bottom of the outer valleys of their city up the side of the Entoto Mountains to make a living collecting fuelwood. The women march up to 16 kilometers (10 miles) in search of wood, bark, branches and dried leaves from eucalyptus trees (Eucalyptus globulus), carrying it on their backs to sell as fuelwood — firewood, charcoal and kindling — at market. Average earnings range from $1 to $3 per day. Aragash Boka, 80, used to carry fuelwood from Entoto Forest, but now she packs twigs, leaves and bark in bags to sell as stove fire-starter. Photo by Christopher Lett/Mongabay. Since the introduction and initial planting of eucalyptus here in the early 1900s, through to the establishment of large groves seeded en masse by the 1970s, every part of the tree gets harvested primarily for fuel or building. Though the tree isn’t endemic to Africa, it’s taken so well over its short history to the wide-ranging climates of Ethiopia that it’s quietly set up a colony of its own within the economy and ecology of an entire nation. The fuelwood gatherers of Entoto, like Boka, today find themselves caught in the middle as both the cause and the victims of environmental damage done by a plant so vital to them. With only 2 percent of native forests left in the country, reliance on eucalyptus is key to the nearly 90 percent of households that still use wood as their primary way of cooking and cleaning and warming their homes. Generations of women have carried wood from Entoto Mountain to fuel the stoves of Addis Ababa, Ethiopia. Photo by Christopher Lett/Mongabay. The importance of Entoto slices through three centuries and is closely tied to the integral role of forests to human society. After Emperor Menelik II and his wife, Taytu Betul, ascended to the imperial throne in the 1880s, they settled the area and established it as the capital of Ethiopia for a time. A permanent capital was seen as an unusual move, because prior to Menelik II’s reign, the kingdom’s seat of power would rove from forest to forest in pursuit of the natural resources, mainly fuelwood. Menelik II and Taytu Betul are widely known for leading the Ethiopian army to victory against Italy in 1896, including the Battle of Adwa. The victory cemented Ethiopia’s status as a thorn in the side of the European colonizing powers as they scrambled for control in Africa. At the behest of Empress Betul, the capital eventually moved again from Entoto to present-day Addis Ababa, but the connection to the forest there has remained. Though historians debate the timeline of events, the main reasons for the move were simple: fire and water. To fulfill basic needs like fuelwood for an army of nearly 100,000 and their settling families was a daunting challenge. The need for fuelwood was clear, and the lower valleys of Addis Ababa were more hospitable than the wind-whipped hills of Entoto; they even featured hot springs that the empress frequented. 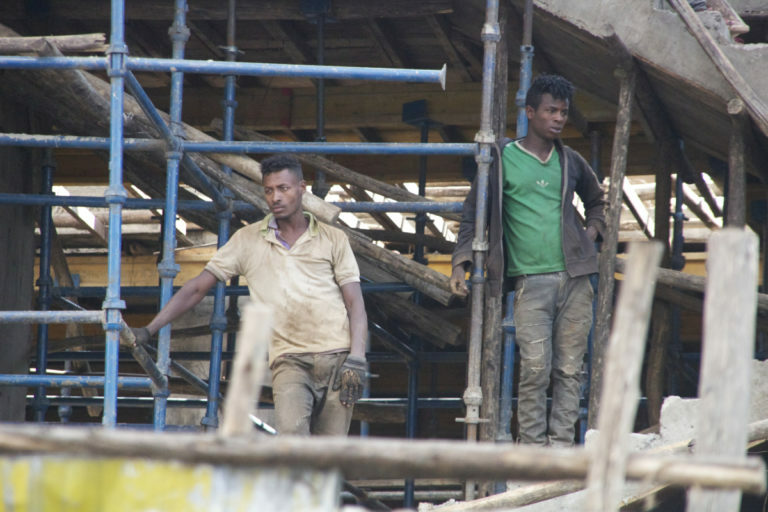 While fuel is a major reason for the proliferation of the fast-growing eucalyptus, it is also used in building construction, often as scaffolding. Photo by Christopher Lett/Mongabay. But the move was a costly one for Addis Ababa’s Acacia-Commiphora ecosystem, which provided a steady water source but whose sparse woodlands yielded limited fuelwood. According to historians, Emperor Menelik II was keenly aware of the need for afforestation and wood conservation when dealing with sustaining large permanent settlements of humans. Several non-native tree species aided in the emperor’s afforestation efforts. One of these was eucalyptus, which became the clear favorite. This artificial establishment of eucalyptus forests on non-forest land near Addis Ababa has since had a lasting impact. The trees blanket Entoto’s hills and valleys where one hundred years ago only the sparse native groves grew within the savanna. The new eucalyptus groves in and around Addis Ababa were reported by European envoys at the time to have transformed the area from “treeless” to the “Town of Eucalyptus Trees.” This transformation happened because Australian eucalyptus tree grows much faster than the indigenous tree species seemed to be the solution needed in the growing empire. A wood carrier takes a break along a footpath on Entoto Mountain. Photo by Christopher Lett/Mongabay. As fuelwood gatherer Boka picks up bundles of sticks, she quietly shares how she gave up carrying fuelwood and now settles for the lighter loads of eucalyptus twigs and fallen leaves. In their quest for a sustainable income, the younger women march past her in a uniform of sorts: jelly shoes on their feet, long skirts fortified by swaths of fabric tied at their waists, and scarves wrapped around their heads. Once they agree on a good spot to work, they fan out deeper into the forest to gather wood. They’re dwarfed as they disappear into the enchanted groves of eucalyptus trees standing slim and tall at about 60 meters (just under 200 feet). One woman stays behind to perform the important task of stripping bark from branches to transform into a rope of sorts that will later be used to bundle the foraged wood, bark and branches. Each woman emerges with her arms full, then swiftly returns to the forest as several piles begin to take shape. Eventually the heaping flammable cocktail of forest debris, weighing as much as 90 kilograms (200 pounds), is bundled together by the carrier. The others help hoist it onto her back for the downhill journey to the market. This wood is their only source of livelihood. Approximately 90 percent of the workforce in this backbreaking trade of carrying fuelwood this way in this area are women. Photo by Christopher Lett/Mongabay. The enclave of women fuelwood carriers who labor across the Entoto Mountains echo her story of hard work sustaining a hard life. Each speaks of having to endure some kind of physical pain to avoid the emotional anguish of the alternative: seeing their children go hungry. Some carry wood fulltime, and others only temporarily. “My husband cannot always work, so at times I alone must provide for my children … and I have no other way than this,” says one woman, who doesn’t want to be named. She points to the thick bundle she’s laid on a small footbridge in the forest. The work can be dangerous. Boka sports a wisecracking smile as she tells harrowing tales of when she was younger and strong enough to carry fuelwood like her cohorts. Her thick, brawny ankles and rough palms are evidence that she’s trodden this terrain for decades. 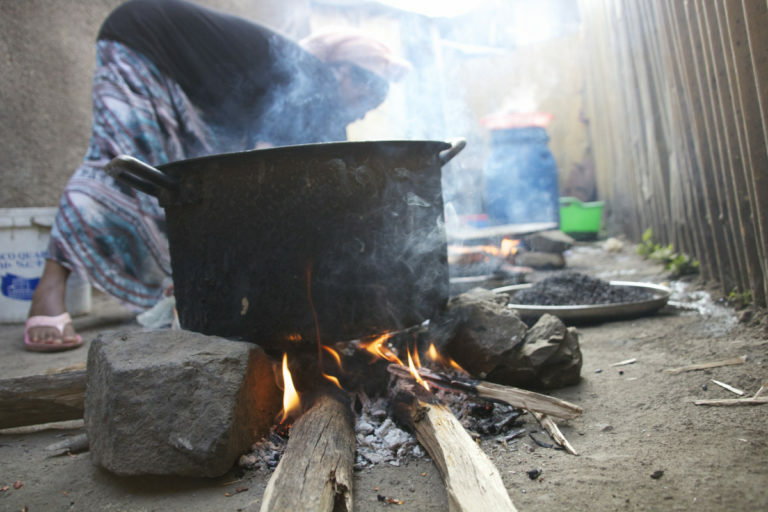 In a place like Addis Ababa, an estimate from 1999 found that one-fourth of resident incomes were going to buying fuelwood and charcoal.” In the two decades since, the population and demand for fuelwood has increased. Alongside these increases so has, the demand for the services Boka and thousands of women like her provide. Why is eucalyptus so destructive? Retaining walls have been installed in areas around Entoto Mountain in an attempt to halt erosion caused by extensive eucalyptus plantations. Photo by Christopher Lett/Mongabay. Farther into Entoto’s rocky red hills and valleys, the landscape is peppered with ancient obsidian. Shiny black and sharp to the touch, this volcanic glass millions of years old is everywhere on the slope, erupting from the soil along with the roots of the eucalyptus planted in droves decades ago. These trees are the predominant species in the area, and today make up the majority of this range’s available forest fuel, giving the plantation a monolithic look. As the slope steepens, the valley opens up into an eroded crevasse 2 to 3 meters (6 to 10 feet) wide, held stable in the middle by a low-tech retaining wall made of stones wrapped in chicken wire like a net full of fish. Down the mountain there’s a sharp contrast of lush green eucalyptus groves to the east that descend into dusty tawny clay to the western upslope, with dugouts for tiny saplings of indigenous acacia trees (Acacia seyal) in between. A rusty old metal sign explains that the area is a government reforestation project. The primary reason for large plantations of Eucalyptus is for cooking. Here a woman makes a traditional non-alcoholic beer served at Islamic celebrations. Photo by Christopher Lett/Mongabay. Debissa Lemessa, a landscape ecologist and director of the Ethiopian Biodiversity Institute, confirms that there are ongoing replanting efforts taking place across the nation like the one at Entoto. He says the proliferation of eucalyptus is due in part to how thirsty the tree is. Its roots are remarkably efficient at sucking up the water from the ground, with a taproot that can reach down five times deeper than the tree’s height. For a time, it was planted in the wetlands of Ethiopia, as the soil it left behind was ideal for growing crops, Lemessa said. There was a catch, though. The fertility of the soil didn’t last long, and now many of those former wetland areas have become inhospitable to anything except eucalyptus. Today, with a rapidly expanding population of just over 100 million people, the pressure to burn wood for energy is massive. Lemessa highlights the economic trade-off of eucalyptus in the fuelwood market: An easily replenished timber, eucalyptus grows 10 times faster than most native tree species. It meets a critical need for the people of the most populous landlocked African nation, where one of the largest household expenses is fuelwood. Burning eucalyptus wood also keeps consumers from burning what researchers call “livestock residue,” or dried cow dung, which can emit higher concentrations of toxins when set on fire. Aragash Boka gathers twigs, leaves and bark in bags to sell as stove fire-starter. Boka earns – on average – the equivalent of $1.50 a day from her work. Photo by Christopher Lett/Mongabay. 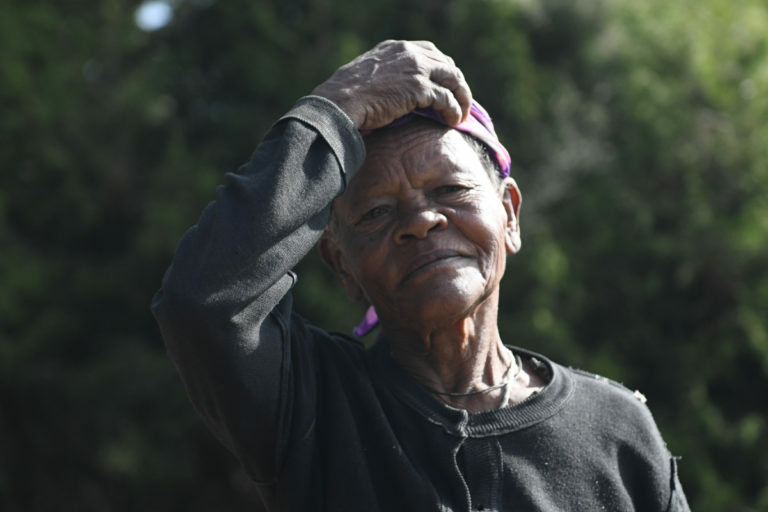 Once fuelwood gatherer Boka finds a good spot to sweep the soil for fallen tree parts, she seems to slide away from the roadside and into the dense woods of the Entoto Mountains, with the eucalyptus closing like a curtain behind her. The tall, straight branches of the trees pierce the smoggy sky and dwarf her frame as she bends down to collect her crop. Despite the backbreaking work that Boka endures, a proud smile spreads easily across her face, and she details several life-or-death encounters she’s had doing this work. Many of the women wood carriers face threats from wildlife, and Boka is no exception. She tells of how she was once stalked by hyenas as she worked, only to be saved by an Ethiopian Orthodox priest. She’s still shaken by the encounter, even years later, and has since changed how and where she collects her lot. She’s also had more than one fall while working, losing several teeth in the process. Once, she was on her way to the market with a load of sticks balanced on her broad shoulders. A speeding truck barreled downhill clipping the 70-kilogram (150-pound) load knocking her down the mountain. Each missing tooth is an unwelcome reminder of the tumbles she’s taken in the name of survival. Boka used to carry fuelwood, but now she packs twigs, leaves and bark in bags to sell as stove fire-starter. Photo by Christopher Lett/Mongabay. Today her load is a bit lighter, as she no longer carries larger bundles of fuelwood. Instead, she carries the kindling or starter fuel in the form of bark, leaves and twigs. This means she makes less money than when she used to forage for and haul larger pieces of wood. Once Boka’s twigs make it to market, they’re sold to heat coffee pots and fire up the ovens that bake the national dish of Ethiopia, enjera, a slightly fermented sponge-like pancake used to sop up platters of soups and spiced vegetables. In Addis Ababa, approximately 35 percent of household fuel is sourced and supplied by women like Boka. Eucalyptus has been cultivated for the better part of 40 years across Ethiopia, and Entoto is home to some of the nation’s oldest groves. But the water tower bio-service that a mountain range like Entoto typically serves has been dramatically reduced here, and scientists point to the vast number of eucalyptus trees grown in the area as a major contributing factor. That’s why Tibebwa Selassie Heckett, a self-proclaimed “Earth Healer,” has spent 20 years working to repopulate Ethiopia with its native and endemic tree species. Her tall, athletic frame fills the driver’s seat of her green Toyota pickup truck as she drives through the savanna south of Addis Ababa that buffers the Rift Valley. She talks with the confidence of a doctor diagnosing the problem and proclaiming the prescription all in one breath. That’s especially the case when she speaks of the imbalance that Ethiopia’s ecosystems have endured due to the lopsided use of forest resources. She also acknowledges the adverse impact of the eucalyptus plantations, which she says have turned the soil acidic over time. This inhibits undergrowth, which is important for soil retention. Tibebwa Selassie Heckett has worked for 20 years to organize disparate groups across the region all concerned about preserving forest biodiversity. Photo by Christopher Lett/Mongabay. Since moving from Ireland to Ethiopia two decades earlier, Selassie Heckett has been focused on a mission of planting, by her count, thousands of indigenous trees across the country. She wants to help rebuild the native forest landscapes devastated by eucalyptus, drought and urban and industrial sprawl. “Elephants used to graze right up to Addis when they had the forests they liked,” Selassie Heckett says. She says she also hopes to make an impact on food security, so she plants what she calls “purpose fruit trees,” indigenous species grown on public land, which can provide a constant source of nutrition for those in need. Much of her conservation and reforestation work is done in partnership with the Ethiopian Orthodox Church. She says clergy “are more open to keeping [trees] alive.” The Orthodox Church here is known for its majestic yet intimate tree gardens outside each church, used by parishioners and others as places for prayer and meditation. That gives the church a strong stake in the survival of native plants, including olive trees (olea europaea ssp. africana), which the gardens typically feature due to their prominence in the Bible. Eucalyptus wood chopped bound and ready for sale at a roadside market in Addis Ababa. Photo by Christopher Lett/Mongabay. “Planting trees is easy, but keeping trees — this is where the challenge comes from,” says Selassie Heckett, a devout Orthodox Christian. 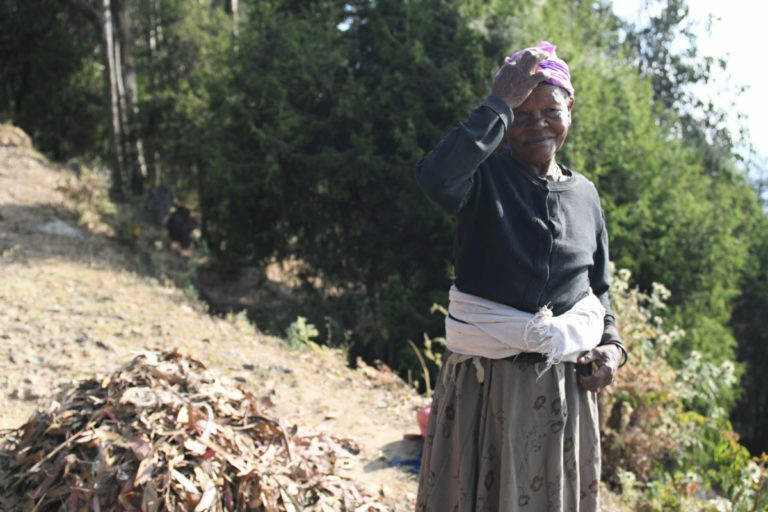 Her love affair with rebuilding the forests in Ethiopia has evolved over time. In 2003, she organized a committee of church and state leaders, including the late President Girma Wolde-Giorgis, to reinstate Arbor Day as a focal point of reforestation. The day celebrates the importance of trees and was first established as a public holiday by Emperor Hailie Selassie I in 1955. Heckett says she shares the vision of Wolde-Giorgis, a forerunner in the nation’s modern biodiversity movement, to heed Emperor Selassie’s prescient message about the balance created by a healthy forest. The visionary leader focused on the nexus of sustainability and the unbreakable bond between the ecological health and economic wealth of a nation. “The existence or nonexistence of forest wealth in the country is one of the most important factors influencing its development and progress,” the emperor declared on Ethiopia’s third Arbor Day celebration on July 19, 1958. View of Addis Ababa, Ethiopia from Entoto Mountain. Photo by Christopher Lett/Mongabay. Attempts at this type of progress are evident at the government-run Ethiopian Biodiversity Institute, where Lemessa and his team of researchers scour the nation for endemic, rare and endangered plant species to protect. While their goals include conservation of the unique genetic resources native to Ethiopia’s forests as well as education on the importance of biodiversity, Lemessa has even bigger plans. Though Lemessa cracks these science jokes about his field, the work he and his team are doing is serious. The biodiversity institute is home to a network of nearly four dozen sites across the country that serve as labs, in-habitat incubators, and seed banks for the protection and proliferation of indigenous plant species key to countering climate change. These efforts are aimed at maintaining the fragile ecological range that comes with managing a topography that varies as widely as Ethiopia’s. From the depths of the Rift Valley, 126 meters (410 feet) below sea level, to the elevations of the highlands at 4,620 meters (15,160 feet), it’s easy to imagine the magnitude of Lemessa’s challenge. Selassie Heckett agrees it’s an uphill battle. Banner image: The primary reason for large plantations of Eucalyptus is for cooking. Here a woman makes a traditional non-alcoholic beer served at Islamic celebrations. Photo by Christopher Lett/Mongabay. Christopher Lett is a photographer and former producer and researcher for CNN and a 2018-2019 Ted Scripps Fellow in Environmental Journalism at the University of Colorado Boulder. You can find him on Twitter at @kolmec.